I am a huge fan of Baroque Opera – the musical trills and thrills push all my aural buttons in equal proportion to my visual appreciation of the sumptuous OTT productions which are so often the default theatre style for live Baroque Opera performance. When glorious music and lavish production are accompanied by the introduction of contemporary wit, fashion and fun: WOW. 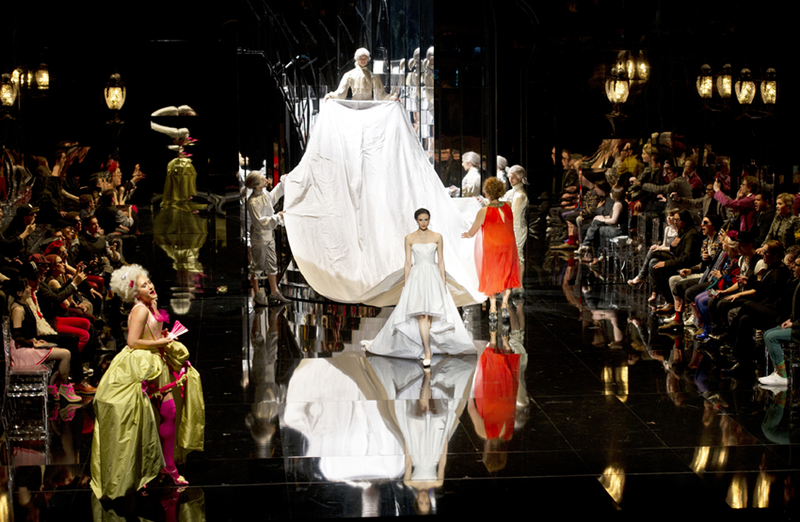 Done well, the avant-garde approach can electrify opera – often perceived as a stuffy and boring art form – for modern audiences. I view such updating as the equivalent of contemporising theatre or art or any other art form. Like it or not, life moves on and opera should adapt or it risks marginalisation as it becomes increasingly inaccessible to a wider audience. Maybe some would prefer an elitist, or more purist, approach but I see this as a slow death and how sad not to bring such magnificent music and voice to as many people as possible. First performed in Versailles in 1745, today’s adaption of Jean-Philippe Rameau’s Platée by Robert Carsen sees fashion industry figureheads playfully transfigured into haughty gods, with Olympus reimagined as Chanel’s headquarters. “Karl Lagerfeld is an absolutely suitable Jupiter,” says Felipe Sanguinetti, the filmmaker behind this backstage view of Carsen’s riotous production, which also features glimpses of Anna Wintour and Hamish Bowles doubles. On stage Lagerfeld as Jupiter, played by Edwin Crossley-Mercer, runs into domestic difficulty at the hands of his jealous wife Juno, a tweed-clad Coco Chanel. The king of the gods goes on to trick Platée—an overweight fashionista—into a doomed romance. Lady Gaga even puts in an appearance as ‘La Folie’ [Madness]. “Each opera I film or photograph by Robert’s side is a masterclass in how to take a story that was imagined in the mind and turn it into a tangible reality,” says Sanguinetti. Trills, thrills, frills and fun … what more could a girl ask for from an evening of musical entertainment? Check out Platee Replayed, on Nowness or Opera Comique, Paris or the youtube video below and, if you see or have seen it, do drop me a line with your thoughts.